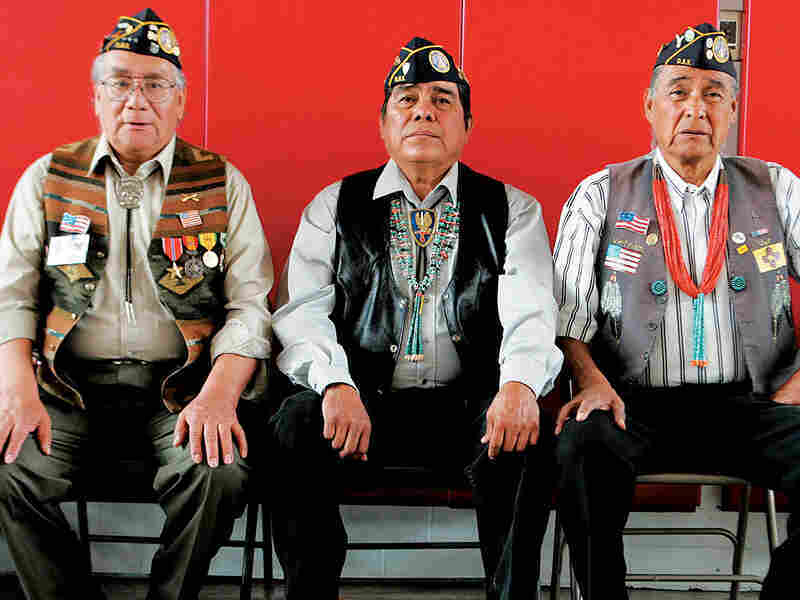 Native American 'Warriors' Mark Military Service Native-Americans have been influential in the U.S. military for more than 200 years. They assisted George Washington, served during the War of 1812 and have continued to defend the country into the 21st century. 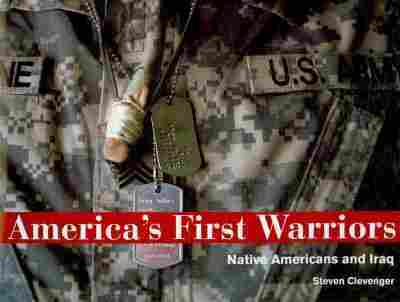 As the nation remembers those who have served in our military, perhaps seldom discussed is the long history of Native American military contributions. 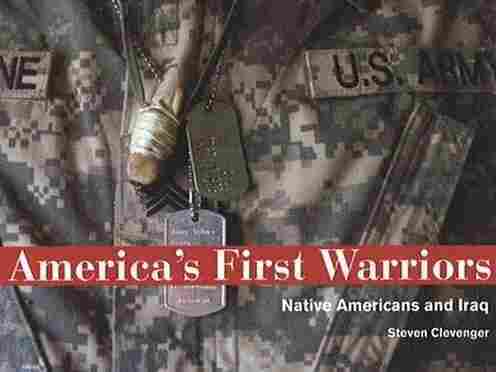 In observance of Veterans Day, NPR host Michel Martin speaks with war correspondent and photojournalist Steven Clevenger about his book "America's First Warriors: Native Americans and Iraq." They were also joined by Native American veteran Lt. Bill Cody Ayon. He explains why "warriors" are so valued in Native American tribes. Steven Clevenger, you have been taking war photographs for three decades. What gave you the idea to do this book? Well, oddly enough I found that it's a subject that really has not been explored. There have been biographies of famous Native American warriors, like Sitting Bull or Crazy Horse but there is nothing that's been done with contemporary warriors. Tell us a little bit more about the warrior tradition. The warrior culture tradition, it seems to be instilled in the youth. As they grow up, they witness how the warrior, the veteran, is honored by his tribe at dances, powwows, etc. And often times, you'll find that the leaders in the tribes are veterans. They've gone through tough times and the tribe has come to depend upon them for wise decision making. Lt. Ayon, you come from a military family yourself. How did you become interested in military service? In my cultural background, my upbringing, raised in my home, we were raised to appreciate and respect veterans through cultural events and I wanted to emulate these individuals that I was around growing up, and all the stories that they told and all the things that they have done. Mr. Clevenger is exactly right, I saw from a young boy that the leaders in our world, the majority of them, were veterans. And I wanted to walk down that road as I got older, as well, so I followed in the footsteps of my father and uncles and I joined the service. Steven Clevenger, you asked every person in your book if they had any reservations about protecting and defending a country that had not always done right by them. What did they say? I think that's a natural question. Anybody who is the least bit familiar with taming of America or the west. These people, they've been brutalized, they've suffered through genocide, forced onto reservations. ... So I would ask them, why would you want to risk your life for a country that has done all these awful things to you and your people. ... They didn't consider themselves fighting for the government, they were fighting for their nation, for their people, to protect them. Lt. Ayon, how did you answer that question? Our people are still tied to this sacred land. It doesn't matter what entity came over and are in charge of the country now. This soil is still sacred to our people. Therefore, those that serve in the military, in essence, may not be just defending the United States of America but we're defending our land where our grandfathers are buried, where our grandmothers are. That's why you go out and still defend this soil, this way of life that we've kept alive generation after generation. These ceremonies and returning ceremonies are to cleanse the person before they leave, so they know that they are supported at home, which makes their job a little bit easier when they leave. And also when they return home as a purification rite, showing that all the bad they've seen or all the hurt they have felt or all the evil that surrounded them in whatever portion of the world they may have been in, or what situation they may have been in, is left behind. Like one of my uncles used to say, "It follows them like a shadow cast off. It's behind them now." By all the family coming together and helping send you off this way, and helping you come back in the same fashion, returning the same way, it reassures the service member he's not alone in this fight. Because when a warrior goes off, he goes off to defend his way of life, to defend what is our culture, what is deemed our way of being, our way of living. And when he returns, he needs to be brought back into that circle, into that light. By having all people around him support him in this manner, it's a cleansing aspect. We sing Dog Soldier songs in the sweat lodge. Dog Soldier songs are very old. They were passed on to my father and his wife. And these songs are sung in times of great need, and great strength is needed to do something like this. My father and his wife sing these songs for me in the sweat lodge, so that I will have the courage to do what I have to do. Also, we sing many songs in the sweat for strength, for endurance that we'll need in the days to come. When I stepped off to leave from our home and came over on this deployment, I was blessed with my father's eagle fan, and he said prayers over me with my family around me in a circle. And I feel that power that is created from their love and appreciation of what I'm doing, and from what other service members are doing. I feel it is an honor to defend what is America now. Because it is where our people and where my family resides. Therefore, I am still carrying on the tradition that was passed on to us, which is to defend our homeland. That aspect hasn't changed. Whether it is an American flag or a camp circle of lodges. That unique representation has always been there inside me. To me there is no irony in that. There is only honor in defending what is yours, what is your way of life. The old ones did that because they felt they were being encroached upon and their lifestyle was threatened. The way they thought the world to be was threatened. So they fought for their very lives against overwhelming odds. And that is to be honored. As we see throughout history that people are subdued, or conquered if you will. But their spirit never is. The spirit of that culture never is. I don't think there is a Cheyenne today that will tell you that we were conquered. I won't tell you that, and I don't expect any other Cheyenne to tell you that.Tricked, duped, maybe. That is a whole different ball of wax. But no, I feel no irony in defending my country and defending my way of life and my people and my family. I feel no irony in that. Like I said, I see only honor. And I'm glad to see my people still respect that. Whether it's a warrior for the United States flag or it's a warrior for the Cheyenne people. That is what it is to be honored. That is what it is to be a warrior. We as Cheyenne people aren't going out to pick a fight. But when you come pick a fight, we bring a fight. And that is what I love about our culture. And whether you believe it or not, that is the same culture that America is built on. And I think that is why Native Americans hold close to that ideal. I think that when you come from a society or a family like mine, where they raise you in this fashion, where they honor you to be in the military and serve your country, that's what you are supposed to do. To defend this country and defend your tribe and defend your people and your land. You are supposed to do that. You are supposed to give yourself for the betterment of the people and the betterment of man. I feel that when you go into something with that mind-set, you are light-years above a young man who might come into the service and say, "I did this for college money." When you have eighteen years behind you, your family telling you every day, this is how a warrior is, these are the people you come from, look at the battles they fought, look at the trials they faced. You can stand up in front of a person like that and say, "This isn't that big of a deal." And when I return home, I'll be a stronger man because of it. States, when our tribe was roaming free, there was a man and his name was Red Robe. Red Robe lost two sons in a conflict with our enemy the Crow. Because of this, he gave all that he had away. He was in mourning. He had a lot of horses, a lot of wealth for the time. He had a prominent family. He was an elder who was revered in the tribe. He gave everything away. He didn't want anything. He pretty much lived homeless. Elk—they all came together and asked him to come back to the camp. Because he was living on the outskirts, away from the people. He didn't want to be a part of people's life. They came together and honored this elder and asked him to come back. He still refused. He said that his sons had died and he was in mourning for them. The societies told him, "Your sons died in the best way that a Cheyenne ever could. And that is to die in battle. He didn't live to be an old man. He didn't live to die of sickness. Your sons died defending their people, their way of life, which is the warrior culture of our tribe." There was a soldier, a leader of one of the societies, the Bow String Society. His name was Two Twist. Two Twist made a vow, a pledge that he would lead the tribe against the Crow. He would die in battle. This would be the last battle on earth. All the tribe at that time vowed to go with him when he made this pledge. The tribe moved against the Crow in mass formation. Two Twist led the Cheyenne against the Crow. And the Crow scouts saw they were coming and dug in. They knew they were surrounded in this valley where they were at. The Cheyenne let up. Two Twist led the tribe. He sang his war songs. His Bow String war songs. Made his pledge that he would never walk on this earth again. And all he had was a weapon that he had captured from the enemy. He had a saber. And he led the tribe into battle on his pony with this saber, and nothing else. He charged into the Crow. And he made all the rest of the people stay back until he went first into the fight. He jumped into the breastworks of the Crow and fought by himself. The people saw him go down in the dust. He was dragged down as he was fighting his way through the enemy. At that time, the Cheyenne moved forward, surrounded the Crow and scattered the Crow to the wind. And beat back their enemy and destroyed them. Two Twist lived through this battle. They found him, and he was still alive. From that day on, he was revered as a great warrior and a tribal leader. Which he became later on in life. The people never let him fight again because he had made this vow for another man. Red Robe took him as his son. Red Robe honored him. Red Robe told the rest of the people that in this way you honor those who go to combat for you, that go to war for you. By telling you this story, I want to show you that we as native people, as Cheyenne, still do that to this day. People such as myself and my family and my loved ones and people I know have come forth to represent our country in times of need like this. When we come back home, our families carry on that tradition that Red Robe did. He was honored that Two Twist went to fight for him, to die for him. In this way, you give them honor, the support, the recognition they need. Just as in the old days. Two Twist was one of the greatest warriors our tribe has ever known. Because of this, our people move forward in that same fashion to this day.